1. To understand the theme of the cosmetic to be displayed. The theme is to express the information and give the guests the first impression, and to attract the eye. 2. The simpler the better. As we all know there are many types of cosmetics, if placed casually will give people the feeling of chaos. Guests receive the information within 1 to 2 seconds to, it has been in the brain to determine whether your product is attractive. So to choose a representative of the cosmetic display, the overall display to be simple. Cosmetics on the shelf is best to have a bright and　short slogan, or accompanied by some beautiful pictures as a background map. 3. To highlight the characteristics of cosmetics. The meaning of the characteristics is to select a special product, the implementation of new cosmetics or guests daily most often used cosmetics to show. Can be arranged by the venue, accompanied by lighting and other means to highlight its focus. Especially in the cosmetics area of ​​the mall, according to the size of the traffic and cosmetics display in front of the width of the aisle to adjust the size of their cosmetics display stand. 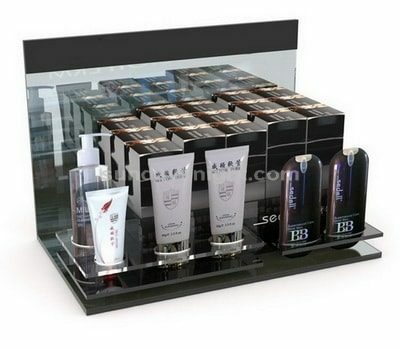 Therefore, the acrylic cosmetics display stand is best tailored, from the source control good size. This has a suitable cosmetic display stand will not affect the aisle and traffic. If you can choose acrylic display stands according above tips, then we believe your cosmetics will be able to attract the guests eye, thereby increasing sales.